I can’t tell you how many times I have had to scramble and do a mediocre speed clean of my living room before company arrives. My kids tend to just leave their backpacks, shoes, socks, toys, etc. in a trail through the living room as soon as they walk in the door. When does it get cleaned? When I realize my book club ladies are five minutes away and I have a near panic attack and the room barely looks organized. Here are some tips I figured out along the way that have helped cut back on the whirlwind cleans and kept our living room looking put together…most of the time! While wastebaskets are common necessities in the kitchen, bathroom and office, they are rarely seen in living rooms. I never even thought to buy one for the living room because I was worried it would smell and make the room look unpleasant. But after a trip to my neighborhood bargain home-goods store, there were plenty of aesthetically pleasing wastebaskets are now readily available in a variety of styles, materials and colors. Find a small trash bin that blends with your living room style and tuck it away under an end table. This easy, low-cost solution makes it easier for kids and grownups alike to put their snack wrappers and miscellaneous small discards where they belong instead of on your coffee table or all over the floor like my kids love to do. 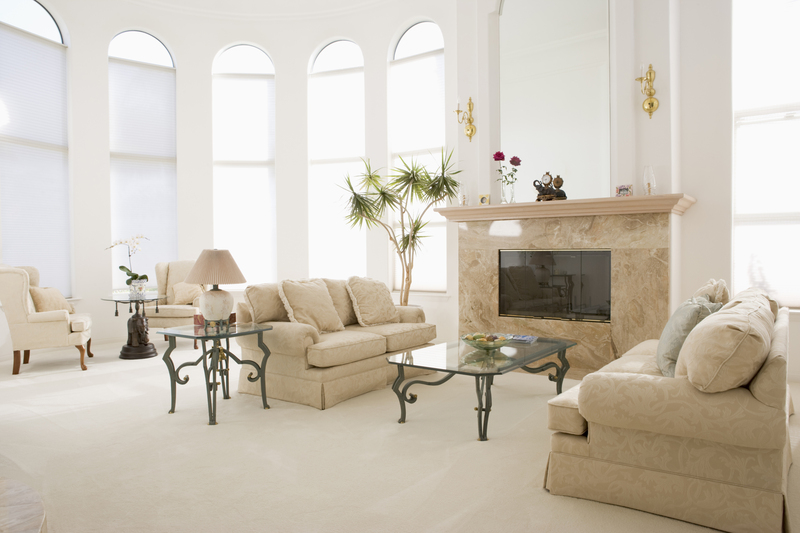 Living rooms are home to a host of flat surfaces. Coffee tables, end tables, curio cabinets and entertainment centers are tempting places for piling up stuff. 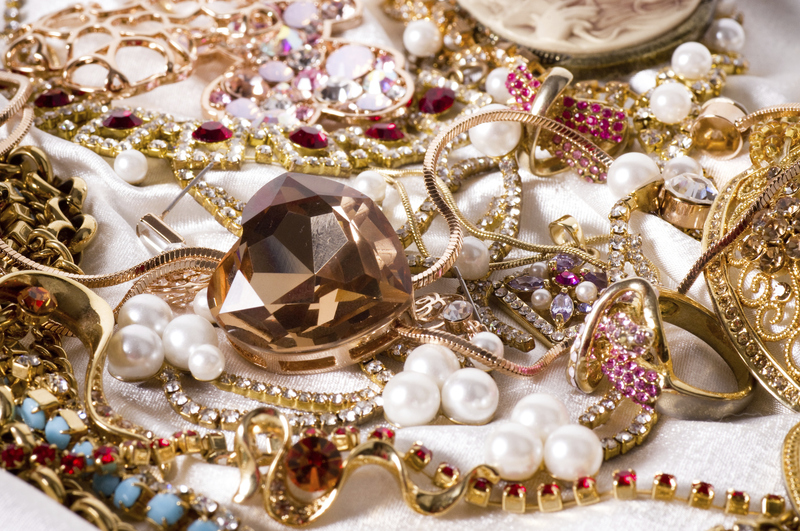 Stop clutter before it starts by creating designated places for common items. I bought several cheap baskets and organizers for mail, magazines, newspapers and homework assignments to keep everything looking tidy. This also helps your kids remember where they put that “missing” homework assignment! Stray cords can cause chaos in your living room. Few things are more aggravating (and unsafe!) than continually tripping over the cords running from your TV, computer, and gaming systems. It’s super quick and easy to group related cords together with zip ties to prevent tangling and easily find which cord matches what. For those pesky devices with multiple cords, try colored electrical tape for easily distinguishing one group of cords from another and keep your husband from yelling out in frustration over the TV going out after a kid trips over the cord and rips it from the TV! Have you ever stepped on a lego in your bare feet? Well I have, and I am telling you right now, that there are few things as painful as that! Keep your kids toys and miscellaneous items off the floor of the living room by creating a play zone. Here is where they should store their favorite toys in one area of your living room– as well as a “toy-free” zone for grownups. No more legos, phew! Choose a child-friendly trunk or bin that can hold their current favorites, store the rest and rotate the contents every few weeks or so as their preferences change. Engage children in a simple pick-up game before bedtime, timed to the length of a short, familiar tune like singing their ABC’s. This works while they are still young, and once they’re older they understand how to try and stay organized. Framed photos personalize a room and give you a chance to show off your lovely family, but they can overtake your valuable tabletop space and your guests won’t have any room to put their wine glass down. Save surface space and dusting time by putting several photos together in one larger, wall mounted frame to create a stylish wall display. If you want to add a modern touch to your living room, look into a digital picture frame. I personally love mine! It was super easy to set up, you can scan paper photos into your computer or upload images to a single, digital picture frame that can store and rotate thousands of photos in a personalized slideshow that is sure to captivate guests. A living room that feels like your local Best Buy store is hard to relax in. My family loves watching movies and we have created quite the collection of DVDs that started to take over my entire TV stand. Invest in a stylish entertainment center or, at least some CD/DVD towers to keep favorite videos and your husband’s old Rolling Stones CD’s off the floor and coffee table. 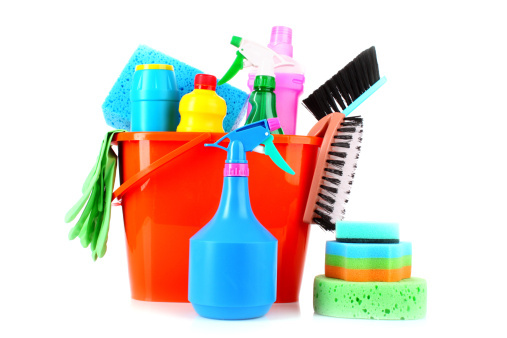 This entry was posted in Cleaning Tips, Organized Living on October 29, 2014 by Sarah Busch. Although it’s great to recycle those plastic grocery bags from the store, they usually end up scattered under your sink or shoved into drawers never to be used again. Purchase an inexpensive cabinet-mounted or free standing bag holder to create space for more important kitchen items. When the holder gets filled up, recycle them or donate extra bags to a food bank. Better yet, invest in inexpensive fabric bags for grocery shopping. Many markets offer small cash discounts for using them and the environment will love you! Before I got organized, there was no rhyme or reason to the items in each cabinet, making it nearly impossible to get a meal on the table in a reasonable amount of time. Move special occasion dishes and other infrequently used pieces to a cabinet in the dining room or the highest shelf in your kitchen cabinets. If you have a lot of wine glasses like I do, optimize stemware space by placing every other glass upside down. Bowls, Tupperware, and casserole dishes can nest one inside the other. Finally, keep cups, plates and bowls you use most often toward the front of the cabinet, while that precious bone china passed down from your great aunt can be moved to the back or displayed behind glass. Knives and forks and pizza slicers–oh my! Those stray steak knives are a safety hazard—and searching for the right tool slows down meal prep time more than you know. 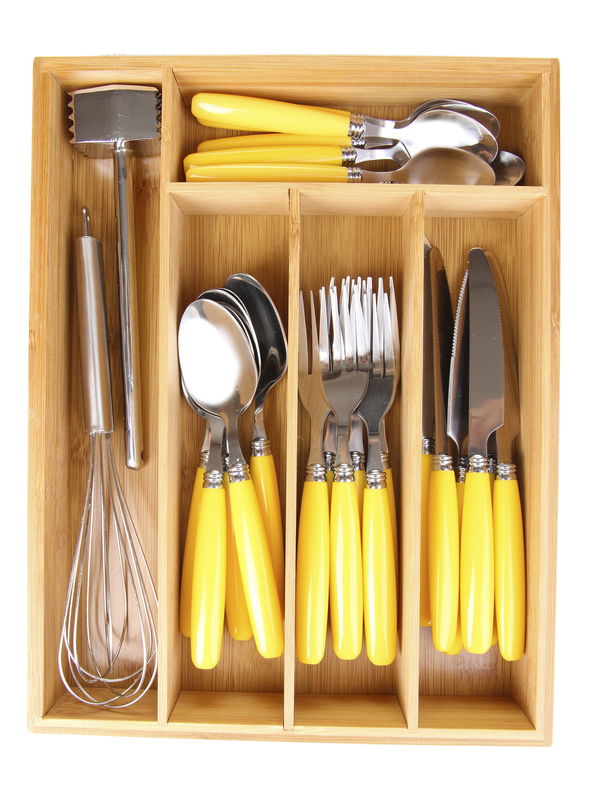 If your utensil drawer is a disaster, one trip to your favorite home store will reveal a plethora of drawer organizers that can keep all of your utensils compartmentalized and clean–and speed up the stir fry and salad fixing. Two-week old pot roast has no place in your refrigerator. But in this house, leftovers get buried in the back of the fridge and are soon forgotten. First, start fresh. I pulled everything out, checked all the expiration dates and get rid of foods that have gone bad, you’d be surprised how many old jars and expired condiments you have sitting around. Also a great time to give the shelves a quick facelift! Place items back inside, grouped together based on type and frequency of use, with more perishable items toward the front. When it comes time to put leftovers in the fridge, ask your family if they plan on eating any more in the next day or so. I try to keep Chet and the kids honest on this one…If they say yes, keep it. If they say no, throw it away right then and there. A quick inventory check every evening will keep your refrigerator clutter-free and fresh. There are so many quick fixes for the kitchen that I never even thought about before. But now that everything is in its right place and I can actually find the previously elusive whisk in my drawers, I would never let my kitchen go back to its cluttered state! Short on time? 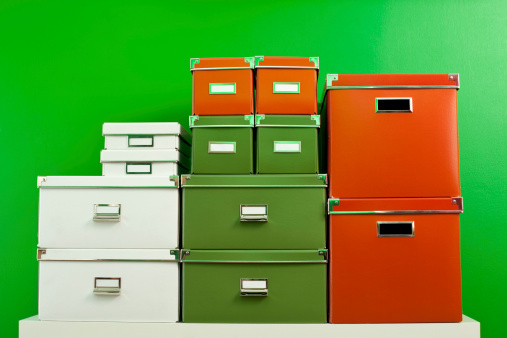 It’s easy to find a few minutes here and there to de-clutter one drawer or cabinet at a time. Soon enough, your kitchen will be ready for an appearance in Better Homes and Gardens. This entry was posted in Organized Living and tagged kitchen organization on October 1, 2014 by Sarah Busch. What’s better than sitting out on the porch on a beautiful summer evening with good eats and a happy hour libation (especially if the kids are out)? If you’re fortunate enough to have an outdoor living area, keeping it clean can be a significant challenge because you’re much more susceptible to the full wrath of mother nature. Prepping our outside living areas for summer-ready entertaining doesn’t need to be a big chore. With just a few simple items and a game plan, you’ll be relaxing with your feet up and a nice cold beverage in no time. First, gather your supplies. This may include rags, a bucket, mild soap and water, glass cleaner, a broom and a vacuum. 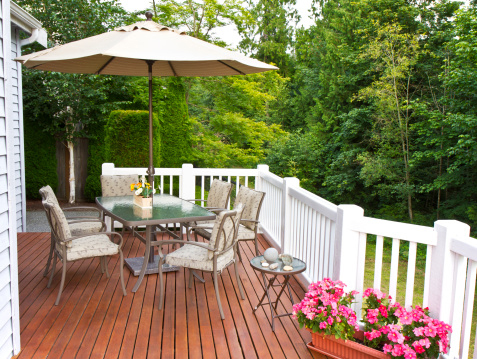 Every porch/deck/patio is different so you may need additional supplies, but this list is a great start. Using a broom, clean beginning with the highest point first. Brush down the siding making certain to grab any dirt and cobwebs. Sweep all the debris and remove. Then, using soapy water, wipe down the siding as well as window sills and thresholds. Use glass cleaner to clean the door and any windows. Vacuum any carpet areas and thoroughly shake out any light rugs and toss into the washer. That’s the easy stuff. Next up, the furniture. Depending on which type of outdoor furniture you have, clean furniture and decorations as described below and allow them to completely air dry before placing any guests in them. Wood and Wicker – Brush or vacuum trapped dirt and dust. Using a cloth dampened with water and a mild soap, wipe down thoroughly. Vinyl and Resin – Brush or vacuum any dirt and dust. Clean with a sponge or soft cloth dampened with water and a mild soap. Rinse by hosing down. Using oxygen bleach or vinegar mixed with water (2 TBSP per 1 gallon water) will help to remove any mildew stains. To prevent future stains, repel dirt and make the furniture easier to clean, rub car wax on the surface once it is cleaned. Wrought Iron – Remove any algae with a brush and disinfectant. Clean thoroughly with a cloth dampened with water and a mild soap. Outdoor cushions – Clean with a sponge, water and mild soap. Prop them in the sun to dry. Umbrellas – Use warm water and a safe cleaner to rinse away mildew and then leave open to dry. Going toe-to-toe with mother nature is never easy, but with a plan and the right tools, there’s no reason your outdoor living space can’t gleam like the inside of your house. Plus, with many newquick clean vacuuming products available for tackling outdoor messes, the great outdoors just got a little greater. This entry was posted in Cleaning Tips, Organized Living and tagged cleaning tips, Entertaining, outdoor living on June 20, 2014 by Sarah Busch.